Download this movie (MP4, 20.6 MB). 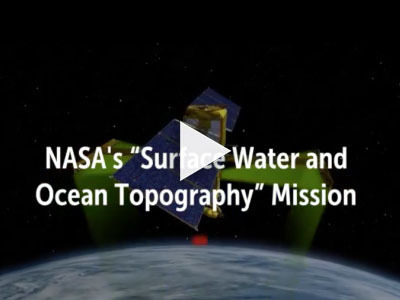 [23-Mar-17] Where There's Water...There's SWOT provides an overview of the Surface Water and Ocean Topography (SWOT) mission, which will make the first global survey of Earth's surface water. Animated scenes showing SWOT in orbit illustrate how the satellite will collect data over land and ocean using wide-swath technology (interferometry) and a downward-looking altimeter. Scenes depict how SWOT hydrologic data will be used for societal benefit such as drought monitoring, reservoir storage, and flood forecasts. Significant improvement in the spatial resolution of sea surface height will help scientists better understand the transport of heat and carbon by our ocean while providing direct benefit to maritime industries, coastal operations, and fisheries management.